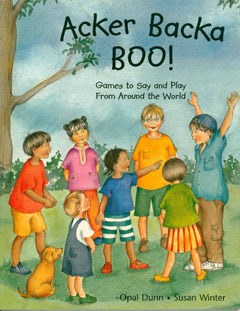 Acker Backa Boo by Opul Dunn and with illustrations by Susan Winter is a fascinating collection of rhymes and games from all over the world, which helps children develop socially and emotionally whilst having fun. The games are favourites from the United States, Europe, Asia, and Africa, and reflect the similarities and differences of how children play. Grouped according to type - for instance, 'Easy Peasy Games' and 'You're It!' - each includes clear instructions for parents, teachers, and carers on how to demonstrate the games and how to manage children's play effectively. spirit of children at play. At a time when we are being encouraged to take more exercise as a family, Acker Backa Boo is the perfect book to take to the park, use in the playground or even in the garden. Children and adults will enjoy the sense of play and fun and laughter this book brings. Acker Backa Boo by Opul Dunn with illustrations by Susan Winter is available to buy now.